This summer we’ve been teased by remixes and now the wait is over! we’ve got something entirely new! 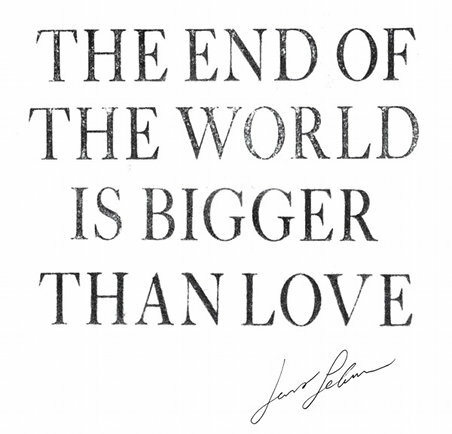 It’s called “The End of the World Is Bigger Than Love”. It’s ever so Jens – whimsical, weary, and winsome. It alludes to typically quirky Jens locales – a Target pharmacy in Brooklyn, Coney Island, etc. It’s all yours for an email address! Of course Jens is always willing to share more than music, and this time there’s a heartfelt note from Jens explaining how a breakup and memories of old made writing hard for a while. he explains, “I didn’t write any songs [in 2008] because you can’t pour manure into an espresso machine and expect a cappuccino to come out.” Head on over to Secretly Canadian for the full correspondence. Hope you feel better soon, Jens! 06/30/2009 paige News Comments Off on Hope you feel better soon, Jens!